A recent study in the Clinical Journal of Sport Medicine found that, while 83% of children and teens surveyed at one Colorado ski resort always wearing a helmet, the odds of helmet use were 9.55 times higher if their parent wore a helmet than if they did not. Contrary to other published research, helmet-wearing behavior was not found to decline as age increased. The top reasons for wearing a helmet included safety (87.7%), parental advice (30.4%) and comfort/warmth (14.6%). The most common reasons for not wearing a helmet included comfort (48.6%) and inconvenience (25.7%). The importance of helmet use in the prevention of injuries was highlighted by the fact that among the participants who wear a helmet, 78.1% indicated that a helmet had protected them in the past during skiing/snowboarding. On the basis of their findings, researchers at Children's Hospital Colorado and the University of Colorado said that "interventions and education targeted at increasing child helmet use during snow sports should be focused on educating parents about the protective value of helmets and the role modeling effect the parent's helmet use [has] on their child's decision to wear a helmet. The reasons prevention efforts are so important are clear from a recent study published in the journal Injury Prevention,  which found that teens are more likely to suffer snow-sports-related traumatic brain injuries (TBIs) than children, and that the teen injury rate had steadily increased over the period 1997-2010. The study, by researchers at the Harborview Injury Prevention and Research Center at the University of Washington, is believed to be the first to use nationally representative data to examine snow-sports-related TBIs among children and adolescents. improved recognition of the clinical symptoms of TBI and increased reporting to EDs for head injuries incurred while skiing or snowboarding. conditioning access to terrain parks - which typically include jumps, half-pipes and harder surfaces that may contribute to head injury risk - on taking an educational module, as many resorts now require. Overall, helmet use has been associated with a 22% to 60% decrease in the rate of head injuries, specifically TBIs. Despite these proven benefits, and the recommendations encouraging their use by governmental and medical organizations, the goal of near-universal use of helmets among child and teen skiers and snowboarders has proved elusive. From July 1996 to December 2010, there were an estimated 78,538 pediatric head injuries reported to U.S. emergency departments (EDs) for snowboarding or skiing during the winter seasons 1996-1997 to 2009-2010. Concussions and intracranial injuries represented the majority of TBI cases, with most other head injuries being attributed to scalp lacerations or contusions/abrasions. Most patients with head injuries were treated and released from the ED, rather than being transferred, admitted or held for observation. The proportion of TBI cases treated and released did not vary substantially over time. The average pediatric head injury rate was 3.14 per 10,000 resort visits. The rate for children did not vary significantly over the 14 seasons, but the TBI incidence among adolescents increased .19 percentage points per year. The likelihood of TBI among children was 111% higher in 2009-2010 than it was in 1996-1997. The likelihood of TBI among adolescents was 250% higher in 2009-2010 than it was in 1996-1997. Make sure boots fit properly and bindings are adjusted correctly. 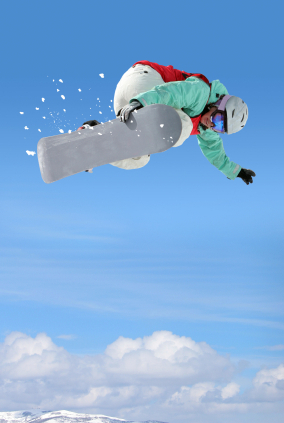 Take a lesson - even experienced skiers and snowboarders can benefit from a review. 1. Provance AJ, Engelman GH, Carry PM. Implications of Parental Influence on Child/Adolescent Helmet Use in Snow Sports. Clin J Sport Med. 2012;22(3):240-243. 2. Graves JM, Whitehill JM, Stream JO, et al. Inj Prev 2013 (e pub March 19, 2013 as doi:10.1136/injuryprev-2012-040727. 3. Gilchrist JTK, Xu L, McGuire LC, et al. Nonfatal traumatic brain injuries related to sports and recreation activities among persons aged ≤19 years-United States, 2001-2009. MMWR Morb Mortal Wkly Rep 2011;60:1337-42. 4. Bakhos LL, Lockhart GR, Myers R, et al. Emergency department visits for concussion in young child athletes. Pediatrics 2010;126:e550-6. 6. Yang J, Phillips G, Xiang H, et al. Hospitalisations for sport-related concussions in US children aged 5 to 18 years during 2000-2004. Br J Sports Med 2008;42:664-9. 7. Cusimano MD, Kwok J. The effectiveness of helmet wear in skiers and snowboarders: a systematic review. Br J Sports Med. 2010;44:781-786. 8. Russell K, Christie J, Hagel BE. The effect of helmets on the risk of head and neck injuries among skiers and snowboarders: a meta-analysis. CMAJ. 2010;182:333-340. 9. Macnab AJ, Smith T, Gagnon FA, et al. Effect of helmet wear on the incidence of head/face and cervical spine injuries in young skiers and snowboarders. In Prev. 2002;8:324-327. 10. Ackery A, Hagel BE, Provvidenza C, et al. An international review of head and spinal cord injuries in alpine skiing and snowboarding. Inj Prev. 2007;13:368-375. 12. Levy AS, Hawkes AP, Hemminger LM, et al. An analysis of head injuries among skiers and snowboarders. J Trauma 2002;53:695-704. 13. Myles ST, Mohtadi NG, Schnittker J. Injuries to the nervous system and spine in downhill skiing. Can J Surg. 1992;35:643-648.